There is a pattern being woven into the skies, planets repeatedly triggering certain degrees, crossing paths, retracing steps, retracting feels, engaging again – exemplifying the nature of astrology itself. Astrology is based upon the principle that nothing can ever be fully known; that there is always another aspect that you didn’t see. We can’t control the stars but we can learn from them and accept that we see what we are meant to exactly when we see it. Monday, Jupiter stations retrograde, encouraging us to reflect inwards on outward expansion and the wisdom we gain through connection. Mars and Venus each take a turn plopping into a blind spot with the Nodes of Fate and on Friday, they convene in a pow-wow of sharing everything but missed marks. Later that evening a Full Moon eclipse in Leo, on the world axis, has a way of concealing some things and revealing others. 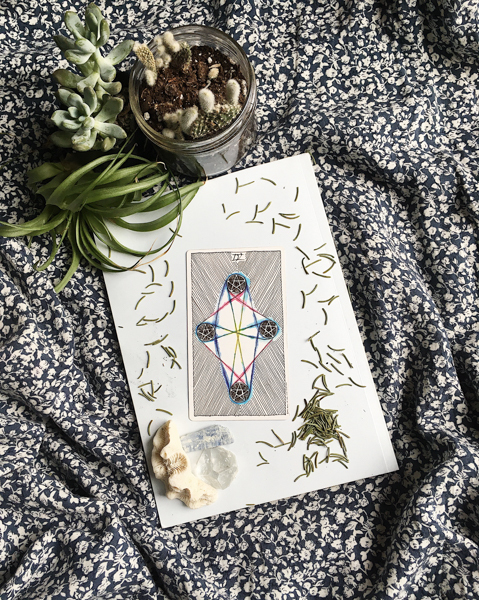 This week, the IV of Pentacles asks us to humbly acknowledge that there might be another layer to a lesson we thought we’d already learned. We’re in the thick of it. The only way out is through the brush so grab your samurai sword and start hacking. Be okay with getting hit in the face by the growth you couldn’t grasp. A dear friend said to me yesterday that she often prays for the universe to whack her over the head with the answer. This week could amaze us with awareness. Pray for clarity and practice gratitude for the bruise it might bring. The IV of Pentacles also asserts there is a difference between perfectionism and striving for excellence. When you only do things that give you reliable results, you might miss a miracle. Are you trying to save the world or control it? The IV of Pentacles contends that both of those tasks are impossible and anyone who tries is going to fail. Trust this. Let go of perfectionism and manipulation. Announce your assets and your flaws. Affirm that doing it imperfectly is doing it good enough and good enough is really effing good.